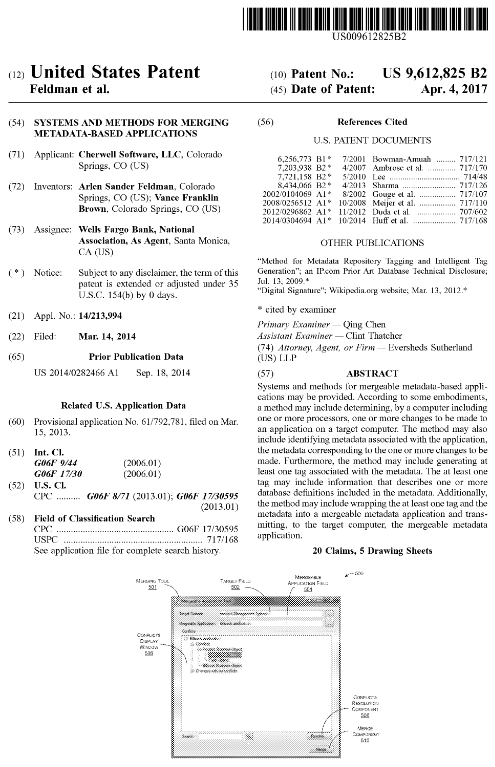 Well, I officially now hold a patent – US Patent #9,612,825 – Systems and Methods for Merging Metadata-Based Applications! I wouldn’t bother reading it if I were you–I wrote the thing, but after the lawyers were done with it, I barely understand it! The application took about three years, and is good for 20 years, by which time the technology on which it is based will be moldering deep in a landfill somewhere. There are goodish reasons in our industry to get patents, and I am proud of what we’ve done, but I have to admit that I am generally not in favor of software patents. I’d happily give mine up–if everyone else would give up theirs at the same time :-). I have had to read a number of patents to make sure we were not in violation, and almost every time I’ve done so, after reading the problem, the patent describes the blindingly obvious approach that just about anyone in the field would have taken to solve the same problem–except that now, they can’t–because someone has patented the blindingly obvious approach. Twenty years might make sense for a patent on a threshing machine, but in the computer world, it is an absurd amount of time. 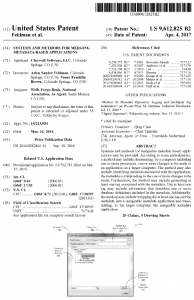 Software patents are wildly abused. Big companies often allow each other to share their portfolios of patents, while small companies are stuck out in the cold. Whole companies exist that don’t add anything to the world except a bunch of lawsuits to protect patents that shouldn’t have been granted in the first place. The stated purpose of patents is to encourage people to release things and get some protection for their invention without the idea immediately being stolen–and to guarantee that the idea will (eventually) go into the public domain. Software patents tend to have the exact opposite effect–preventing new things from being released, or being pulled almost immediately, because of the threat of lawsuits. Nobody looks at old patents to get ideas because, by the time they are legal, they are irrelevant. Most people only look at patents to make sure that they are not in violation–which, I can tell you from personal experience, is a pain in the neck–and you can never really be sure until someone sues, and a court decides. Often the concepts in patents are designed to be as wide as possible–often much wider than any actual reasonable implementation. I had to argue with the lawyers a lot to prevent them from doing that with this patent. I could keep going, but there’s a lot of stuff on this already out in the world. There are probably a few ideas in the software world, mostly related to really complicated algorithms, that might deserve some sort of protection (although 20 years is probably excessive). Even in those cases, I’m not sure that patents are the right approach. One thing that did surprise me–there is a cliché of patents being granted because of overloaded clerks who don’t understand them. In this case, the examiner for this patent had a very good understanding of the concepts and prior art, and raised some really good points. I think his name was Albert something… (Actually, to give them their due, the examiners were Qing Chen and Clint Thatcher). I also have to admit that, despite all of this, getting the final approval did make me grin a bit :-). And what if I don’t and what if I do?